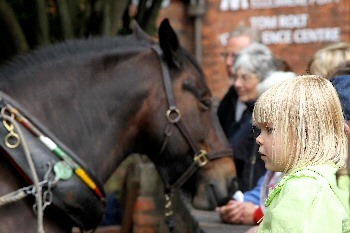 THE Canal and River Trust will be celebrating the early days of canals at the National Waterways Museum, on Sunday, 16 August 2015, with 'Horses at Work and War'. Now in its 6th year, the event has become 1 of the most popular attractions in the Museum's annual calendar of events. Visitors to the Museum will see working horses giving a unique demonstration of horse drawn canal boating, horses being shod, and have the opportunity to take a wagonette ride round the historic canal docks. The Parkgate Pony Sanctuary will be giving pony rides for children; a fun day out for all the family. This year there will also be the opportunity to hear and see how horses were used during wartime; both the Napoleonic era 1815 and First World War 1915. John Inch, General Manager, said:- "We're delighted to be welcoming the Grenadiers a Cheval to the event, fresh from attending the recent 200th anniversary celebrations of Waterloo." As well as the horses, all the usual Museum attractions will be available to visitors:- displays of historic boats, indoor exhibitions, indoor soft play area and activities, boat trips and more. For more information please visit:- CanalRiverTrust.Org.uk/NWM or find them on Facebook. Located next to Junction 9 of the M53.